Free Bible for BlackBerryYouVersion has given you the ability to engage with Scripture like never be | BlackBerry Blast! YouVersion has given you the ability to engage with Scripture like never before, and with YouVersion Bible App for the BlackBerry phones you have access to the Bible, corresponding contributions, and online community no matter where you are. The Bible App is with you...during your morning commute in the tube, while waiting in line at the grocery store, or in church on Sunday. The YouVersion Bible App gives you the power to engage in 41 different translations, in 22 languages, on one device that rests in the palm of your hand. Download the free App and enjoy regular time with the Bible, right when and where you need it. Browse by books of the Bible - the entire Bible is at your fingertips. Search the entire Bible for a word, phrase, or verse, and you'll get your results in seconds. 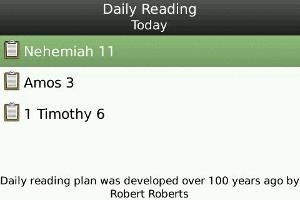 The One-Year Bible Reading Plan provides daily selections to help you read through through the entire Bible in one year. Learn from others by checking out recent user contributions from YouVersion associated with each Bible verse. Easily email Bible verses to your contacts.